Webnode and WordPress are web building platforms, which have already won reputation in their niches. They serve different goals, offering a broad range of tools, exquisite web design features and advanced web building approaches. 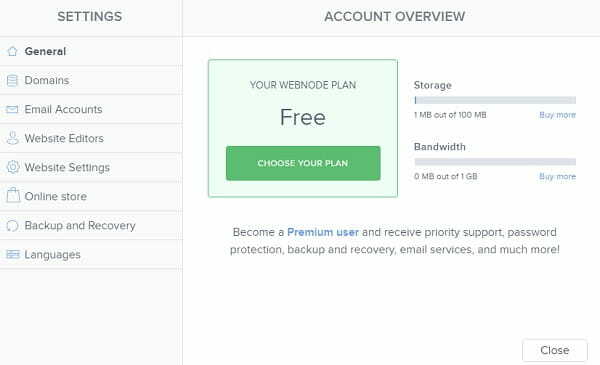 Webnode is a cloud website builder, which has a user-friendly and intuitive interface. Its template gallery is versatile and impressive. The system is mainly used to create two types of websites – personal/business projects and web stores. Its feature set focuses on these major tasks, providing a broad selection of design customization tools. WordPress doesn’t require any introduction. This is the CMS, which boasts worldwide popularity and makes it possible to solve different web building tasks. The system is not easy to master, if you are a newbie. It takes time to get used to it and to learn how to deal with the intricacies of the web building process. Comparing WordPress vs Webnode doesn’t seem to be reasonable at first sight as the platforms differ a lot in their approach to website creation, simplicity and feature set. This, however, does not mean that you cannot choose between these powerful options. So, let’s find out now what system works best for the completion of simple-to-complex web design projects and what user categories may find them more convenient. Webnode. The website builder looks quite simple and intuitive at first sight. When you start exploring it, you make sure it is really convenient and easy-to-use. It doesn’t matter what web design experience you have – using Webnode won’t be difficult at all. The result will also come up to your expectations. The dashboard of the system is understandable and not overloaded with options. 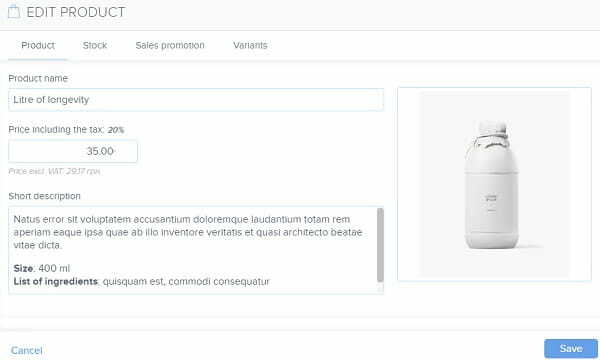 The drag-and-drop editor of the platform makes it possible to add and modify the required website sections as well as to upload the content. Just follow the tips the system generates to learn how to edit your website. WordPress. WordPress is a CMS, and it is the open-source software. Thus, mastering it is not quite easy at all. There are multiple options to be explored here, not to mention the potential risks you may encounter when building a website with the service. At the same time, proficient web designers like working with WordPress as it makes it possible to customize templates by using their HTML/PHP knowledge to edit or write new website codes. There is also an opportunity to integrate free and paid plugins here to get personalized website design. Thus, experienced web designers have more freedom here and can use their knowledge to launch full-featured projects. Webnode vs WordPress. The two systems use quite different approaches to the process of website creation. Webnode is a classic code-free website builder with a standard dashboard and variety of web design features. This is what makes the system a nice start for beginners. WordPress is a more complicated tool that requires certain coding background and experience. It ensures greater freedom of choice and allows building more professional websites. The platform works best for web design pros. Webnode. The website builder comes with a variety of features needed to start an appealing and functional website. As soon as you sign up for the service, you get access to a dashboard with multiple tools. What you can do here to start and manage a decent website is to add and edit website sections or pages, register a domain name, edit your profile, view website statistics, invite co-workers, change website settings etc. This is also the place, where you will find extensive eCommerce and blogging options, rich set of design customization tools, opportunity to create as many pages as your project implies etc. Webnode isn’t rich in apps and widgets. Instead, you can add different content blocks to diversify its design and boost its performance. It is possible to start a web store here, but its functionality may be insufficient to you, especially if you intend to create a large store. What you can do here is to add and manage products, adjust payment and shipping settings as well as other required parameters. At the same time, Webnode somewhat lacks a set of must-have eCommerce features like product export/import, an option allowing to create product variants and generate coupon codes etc. This may be a hindrance, if you have long-lasting plans. What’s more, Webnode supports more than 20 languages, which allows for the creation of multilingual websites. That is another advantage of the service. You can also create the backup version of your website to be able to restore it when needed. The website builder has nice SEO options that contribute to higher ranking of your project in the search engines. To boost your website positions, you can fill out meta tags, customize titles, URLs etc. The system automatically generates the sitemap, eliminating the need to do that on your own. WordPress. The platform offers advanced web design features and tools required to build different types of websites. Mind, however, that WordPress is initially known as a blogging platform. To launch other project types with the system, you’ll need to use your coding skills and integrate multiple plugins. This takes much time and effort and this also requires experience. The CMS allows integrating free and paid plugins to boost your website functionality. There are many of them available on the web. New plugins are being developed by third-party web designers. If you use such plugins, it makes sense to select those that are paid and to deal with trusted specialists. This is because there is always a risk of integrating plugins with malicious codes into your website, which can have negative impact upon its further work, SEO positions, traffic and other crucial parameters. Mind that the more plugins you decide to integrate, the more frequent updates you’ll have to make. This also takes much time and requires specific niche knowledge. Being the CMS, WordPress implies that you should look for website hosting on your own. It’s possible to host your project with the system, but there is also an opportunity to deal with another hosting provider. Apart from that, you can integrate your WordPress account with a third party service to provide access to its database. This is needed to be able to work with file configurations further. Webnode vs WordPress. 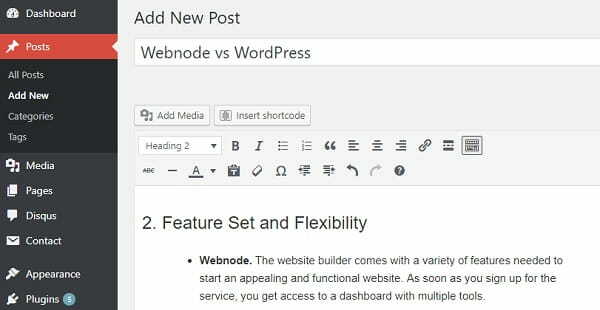 When it comes to the feature set and flexibility, there is no doubt that WordPress has much more options as compared to Webnode. However, it takes time, effort, skills and experience to launch websites with the platform. You have to know how to deal with plugin and code integration, choose hosting and make the required website settings. In other words, you have to create a website almost from scratch here. The only notable demerit of WordPress is the enhanced spam risks. The same cannot be said about Webnode. 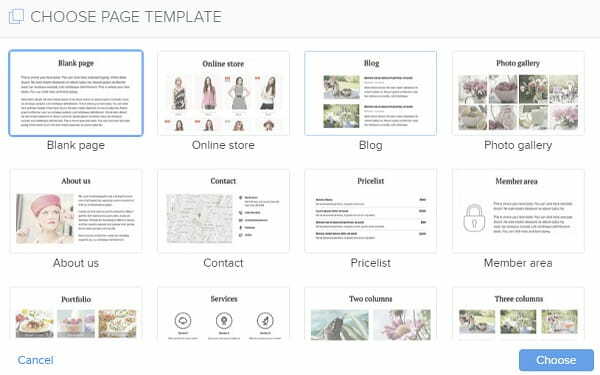 This is a standard website builder, which comes with templates and design customization tools for simpler website creation. Some features of the system are quite powerful, while others are obviously weak. Nonetheless, Webnode still remains a simpler solution for beginners. Webnode. The system template collection is quite extensive and it currently encompasses around 200 themes. Their quality, however, is not on the top notch level. Templates have standard look and are quite similar, mediocre, if not even outdated. The good news is that they are responsive and can be customized by using the toolset the system offers. A convenient preview option allows seeing the work in progress to make the changes before publication. Mind that the system doesn’t allow changing the template during the web design process. This requires serious consideration, when making the choice. WordPress. 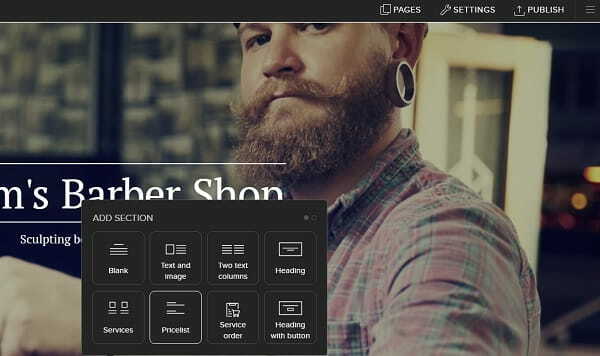 WordPress has free and premium themes to fit different niches. All of them (including premium samples), however, look similar. Being an open-source program, WordPress offers access to CSS files. This makes it possible for professional web developers to give their websites unique look. You can change the style, typography, titles, font parameters, colors, background and other settings. Whatever design ideas and preference you have, WordPress will make it possible to bring them to life. If you lack these skills, your template customization options will be quite limited. Webnode vs WordPress. When it comes to design customization, WordPress is a distinct leader, but only for those users, who have enough coding skills. Otherwise, it will be difficult to create outstanding design with the platform. Webydo design options are more limited, but they will come up to the needs and skills of newbies. Webnode. The website builder cannot boast powerful customer support service. This is not about the quality of services provided (it is on a decent level), but about the list of available options. When working with Webnode, you’ll only have access to the knowledge base with lots of articles and frequent questions divided into categories. WordPress. As an open-source program, WordPress doesn’t offer any customer support services. The community of the system, however, is quite powerful and extensive. This is the only choice for you to get answers to all the service-related questions. Take your time to browse WordPress forums or the topics found in the official WordPress community. WordPress vs Webnode. None of the systems offers multiple customer support options. Webnode users can get enough information in the knowledge base, while WordPress fans can reach the community sources to have their questions answered. Webnode. The system is initially positioned as a free website builder. As you start exploring it, you find out that to reach decent result and to get your website online, you have to upgrade to one of the paid plans. These are the Limited Plan, the Mini Plan, the Standard Plan and the Profi Plan. The cost of the plans ranges between $3.95 and up to $19.95 per month based on the terms provided. WordPress. The platform is absolutely free for any user. This is true, when it concerns the cost of using the service. However, get ready to invest more funds into hosting, premium templates, plugins and extensions. It makes sense to pay for these options, if you wish to minimize the potential risks and avail decent result. Webnode vs WordPress. The final cost of building a website with any of these services depends upon the range of features you need, skills you have and result you hope to get in the long run. WordPress websites are usually more expensive, but they are also full-featured and, thus, offer more chances for effective business promotion. 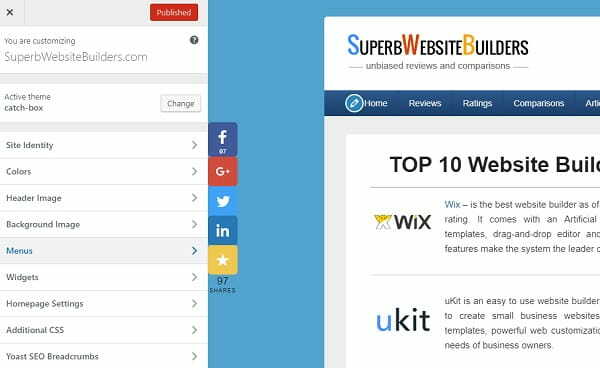 Having analyzed both web building platforms, we’ve realized that they are quite different. The major reasons for that are the nature of the systems and the approach they offer to the web creation process. While Webnode is a standard website builder, WordPress is a compex open-source CMS. With Webnode, any user can launch a nice website for personal or business use as no special coding knowledge is required here. When it comes to WordPress, the situation is quite the opposite. The platform ensures greater flexibility and more advanced functionality. To avail it, however, you have to possess web design skills and experience. The conclusion is as follows: if you are a newbie, then Webnode is a more reasonable solution. However, if you are lucky to have web design experience and desire to run a professional website, then WordPress will work best for you. Good luck!